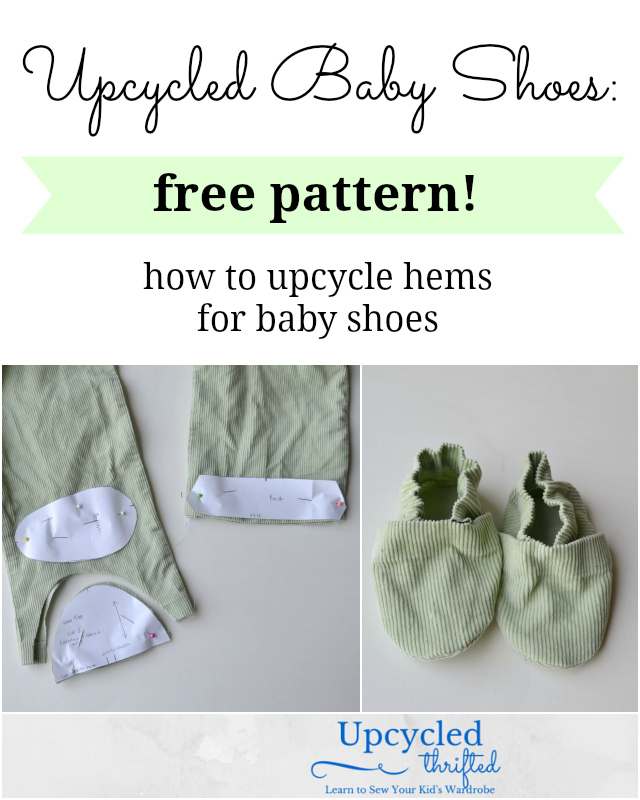 You are here: Home / Free Sewing Patterns / Upcycled Baby Shoes: FREE Pattern! 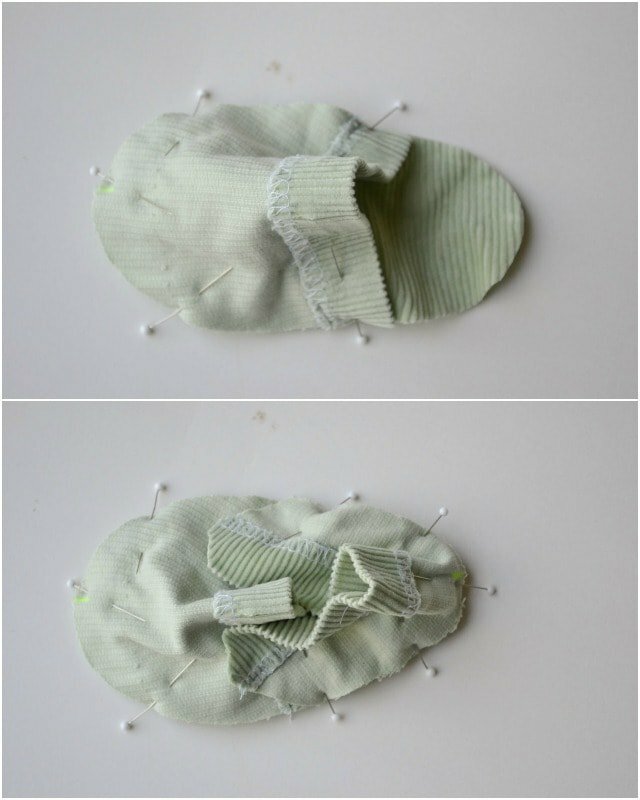 Upcycled Baby Shoes: FREE Pattern! I love making baby shoes. They’re fast and cute, and my babies walk holes into them so quickly. 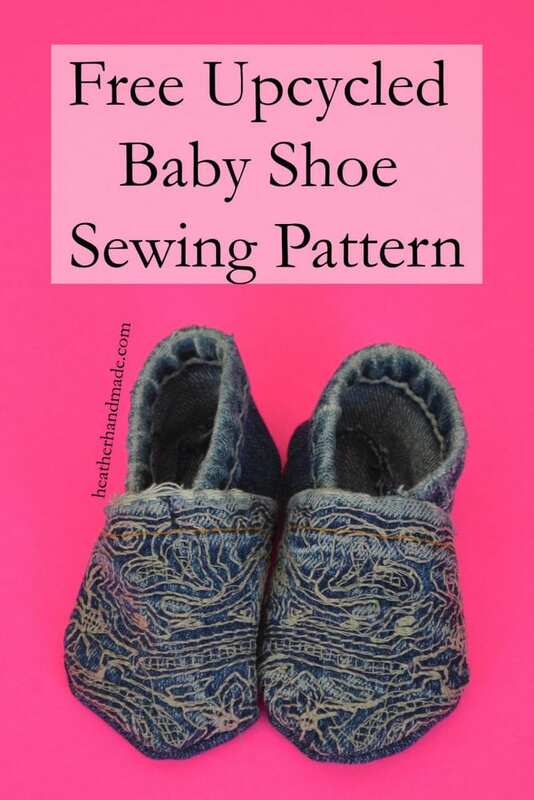 My favorite baby shoes are upcycled baby shoes with this free baby shoes pattern. Upcycling makes them fast to sew since you can reuse the hems of pants as casings. 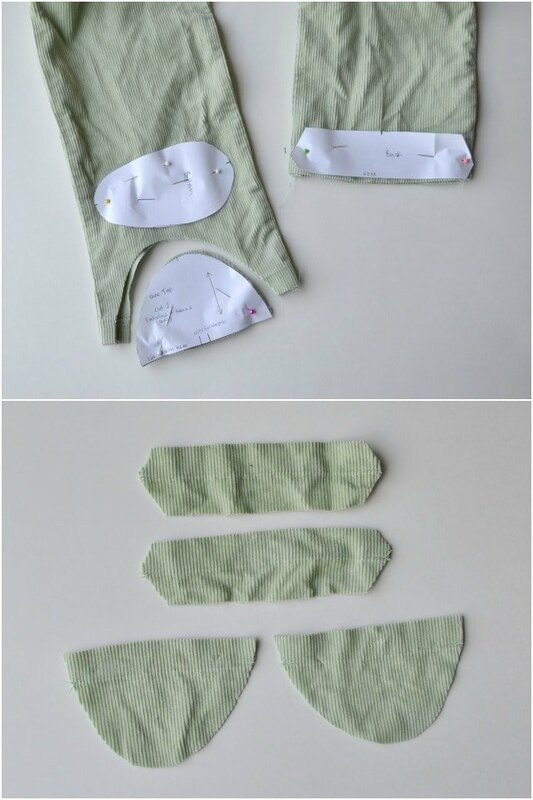 This makes them a half hour or less sewing project! Use the most durable fabric you can find or even use vinyl or leather for the bottom piece. 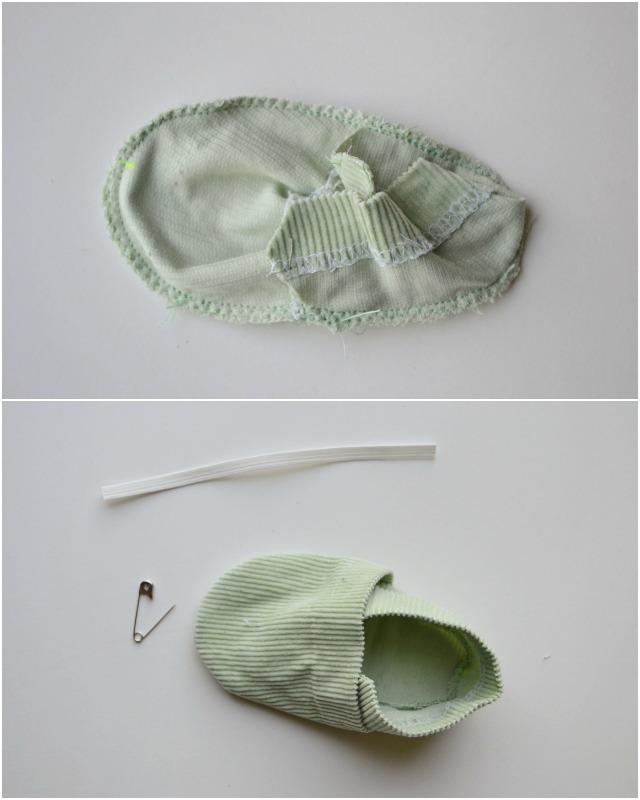 Free baby shoe pattern – Get it at the end of the post! Cut out pieces along the hem. Transfer markings to the fabric. Cut two slits for elastic on hem allowance of the top piece. Tack the cut ends of the hem stitching to keep it from coming undone. Pin top piece to the bottom piece lining up the notches. Then pin the back piece to the bottom piece over the top lining up the notches. 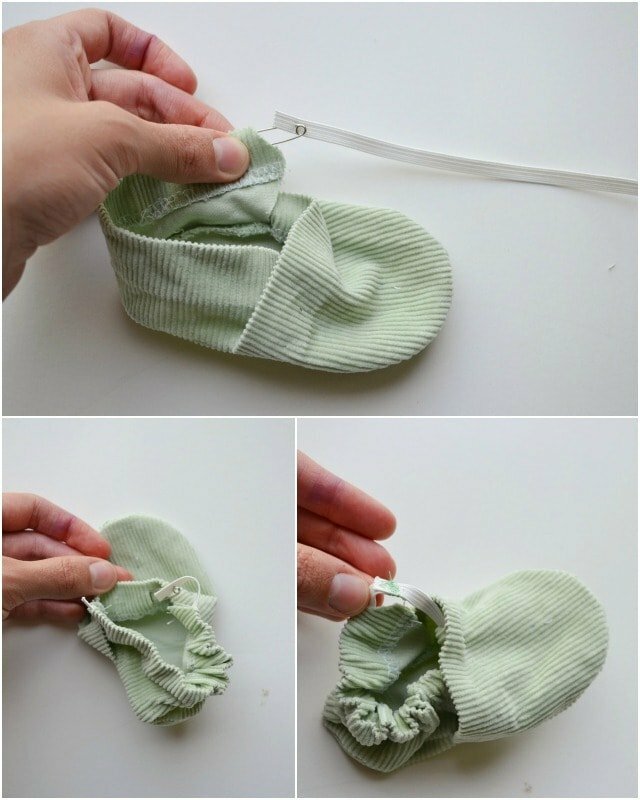 Sew with a 1/8″ all around the shoe. I sewed with a straight stitch and then with a zigzag stitch. Turn right side out. Cut a 6″ piece of elastic. Use a safety pin to insert elastic through the back hem and up through the front two slits. Sew the elastic together overlapping it about 1/2″. Do the same with the other shoe. These shoes fit about a 8-12 mos old baby. My babies have really, really small fit so they are even older before they fit into these shoes! Find the big list of all the upcycling tutorials I’ve created! 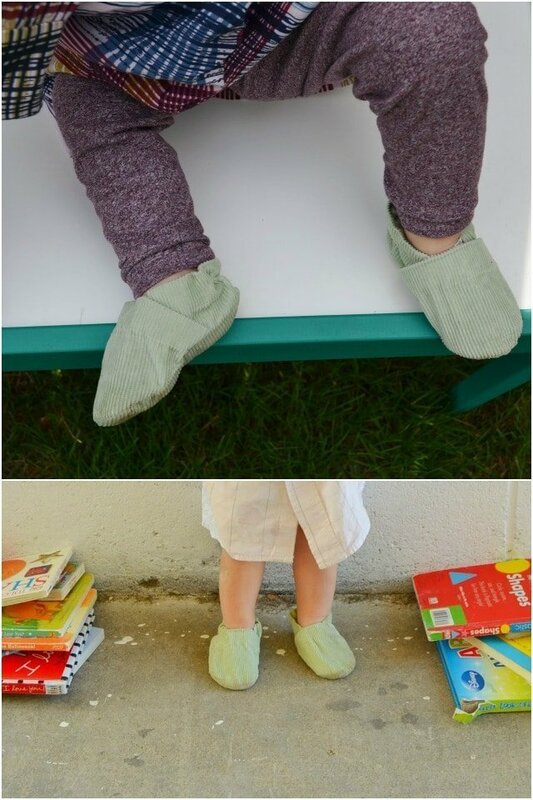 And share any upcycle inspired projects for your children with the hashtag #upcycledkid! 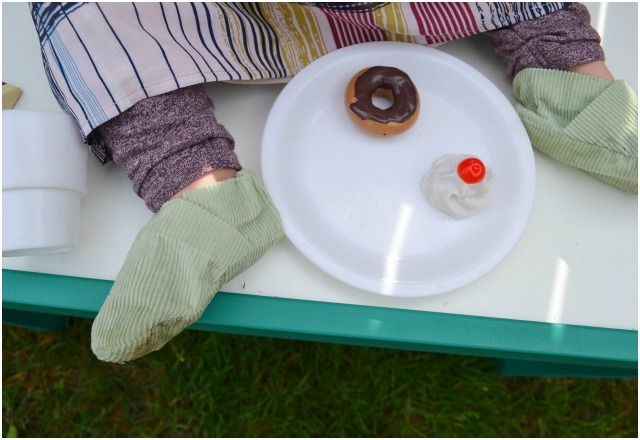 Get the free baby shoes pattern! Once you sign up you’ll get the password to access the subscriber library found here https://www.heatherhandmade.com/free-stuff/. The pattern is a free download in there along with all my other downloads!